Lincoln Park Grid Support Center (a Gas-Fired Power Plant proposed in the Town of Ulster) and SEQR. Suggest that the proposal that seeks to reconnect natural gas infrastructure consider creating a 100% renewable project with battery storage. (*) Citizens are invited to give public testimony at the beginning of the regular ToU Town Board meeting on any items that are listed on the agenda (at this time, the agenda is not yet posted. We will update the public on our Facebook event page when it is available. Please ‘like’ our event for updates VIEW). Citizens will have another opportunity to speak that evening on items not on the agenda at the end of the Town Board meeting. We ask that citizens be respectful when addressing the Town Board, and particularly those who do not live in the municipality. Keep your testimony to 3 minutes or less. On Thanksgiving day while making a holiday meal for friends and family, I received news from a guest that a gas-fired power plant had recently been proposed in the Town of Ulster. In addition, the Town of Ulster had its regular Town Board meeting a few days prior to the Thanksgiving holiday where the applicant and consultant gave a short presentation followed by the Town of Ulster making a request to be Lead Agency in SEQR (State Environmental Quality Review). That gave Involved Agencies only a 30 day window starting before one holiday to another (figures) to dispute their request, if applicable. After eleven years, I had planned to step away from my volunteer work at KingstonCitizens.org to focus my efforts solely on my part time position in Water Quality at Riverkeeper (which I love, by the way) and my music career, come 2018. The news certainly dashed my plans. The balancing act continues! A peaker project in the Town of Ulster. It wasn’t unfamiliar to me. In February of 2015, when Niagara Bottling pulled their proposal from a Tech City location in the Town of Ulster, I remembered hearing rumors of such a project and thinking to myself that after coordinating an intense five month citizen campaign and now having to find a way to move a timely charter change to address water powers with a referendum in the fall of that year, I’d have to come back to it if or when it appeared. In November of 2017, here it was. On first glance looking at the list of Involved Agencies, the NYS Department of Environmental Conservation (NYSDEC) seemed the best choice for a project that could be seen as a regional one, with potential environmental impacts that include air emissions, visual impacts, wetlands, the project footprint being within close proximity of a principal aquifer, cultural resources and threatened/endangered species There might be others. As a local matter, there were potential inconsistencies in the Town’s comprehensive plan and zoning code and concerns of something like this being built only approx. 600 feet away from a residential area. Once a Lead Agency is designated, they may make a determination of significance for the proposed action (project) as being a positive declaration (pos dec) or negative declaration (neg dec) in SEQR. A pos dec in simple terms means that the project may result in having one or more significant adverse environmental impacts, triggering a full scoping process (to identify all of the potential impacts) with opportunities for public comment and then for appropriate studies to be identified and paid for by the applicant. A neg dec, means that the proposed action benefits “outweigh its adverse impacts” and would move the project to its site plan without any public comment. As a side note, a neg dec allows the applicant to apply/secure any public funding that might be available to its project. In November of last year, when Donald Trump became our president-elect, most of the world felt as if it had shifted in an unprecedented way. Whether citizens supported Trump or did not, there was a common feeling of either joyous or defeated disbelief. It wasn’t long after that a list of Trump’s initiatives appeared for his first 100 days in office. With the support of a Republican majority in Congress, Trump’s initiatives suddenly seemed plausible. I saw this as an opportunity to look more closely at the checks and balances that exist in local, state and federal government. We jumped quickly into action, creating a google document (so that citizens could collaborate) that outlines Trump’s initiatives so to better explore their context and, to identify local and New York State policies and laws that could help guide us through this new administration. We hosted very small meetings with a couple dozen citizens to start this important work and realized shortly after that it needed to continue and be open to more citizen’s input. The result is an educational series that will span 2017. 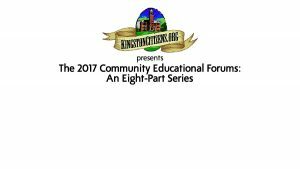 Citizens can expect an array of subjects with expert panelists, a question and answer period, an interactive work session on KingstonCitizens.org’s document “Trump Initiatives and NYS Local/State Policy and Laws” and short tutorials to help navigate the City of Kingston’s municipal website. Thanks to Peter Wetzler and Julie Hedrick of Church Des Artistes who have donated their beautiful space so that we are comfortable and supported in our efforts each month. Please review the list of topics, dates, and details below. We are currently booking more guests and will make those announcements as they are confirmed. For now, put all of the following dates in your calendar! We look forward to meeting more of our neighbors, making new connections and becoming more educated on a whole host of complicated topics. 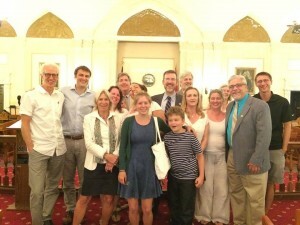 Over the course of the series in 2017, citizens can expect an array of subjects with expert panelists, a question and answer period, an interactive work session on KingstonCitizens.org’s document “Trump Initiatives and NYS Local/State Policy and Laws” and short tutorials to help navigate the City of Kingston’s municipal website. Moderated by KingstonCitizens.org Co-Founder Rebecca Martin. Participants are encouraged to bring a dessert to share. Coffee and tea provided. We encourage citizens to bring along their personal computer laptop if they have one. All dates and topics subject to change. Last night, after many terrific citizen public speakers (see 1:44 – 15:35 in the video above), the Common Council did the first reading (at 44:15 – 45:00) of a charter amendment for Water Powers outside of Kingston’s Corporate boundaries. After which, Mayor Shayne Gallo will have 10 days to organize a public hearing before signing off on the legislation. It would then be prepared and sent to the Board of Election to include on the November ballot. All summer long, KingstonCitizens.org will focus its energies to inspire and to energize our community to vote like it has never done before. Which way that you do is a private matter – but to vote is a right that was hard earned. If this referendum is placed on the ballot – so was it. A lot of blood, sweat and tears. Please be responsible and do your part and vote. Place November 3rd (Election Day) on your calendar today. Both meetings will be filmed. At last week’s Public Safety/General Government Committee meeting, a resolution for a referendum to be placed on the ballot in November passed unanimously through to the Common Council. The referendum, if approved by a full Council vote, would give the public the opportunity to vote on whether or not to amend the charter to include the Common Council for “Water Supply Outside of City”. In Section C11-5C (Water Supply Outside of City), it says: (C) Such sales or sales must be approved by the New York State Water Power and Control Commission” (the NYS Water Power and Control Commission today is the Department of Environmental Conservation aka DEC). The referendum would ask the public to approve or not the inclusion of the Common Council, “and the common council.” That simple amendment would give the public a say as to water sales outside of Kingston’s city limits. Additionally, Kingston would automatically be an “Involved” agency in SEQR in the case one were ever triggered again. In the meantime, the public’s water would have a layer of protection that would allow for thoughtful policy to be developed for sustainable growth and economic development using this precious public resource. 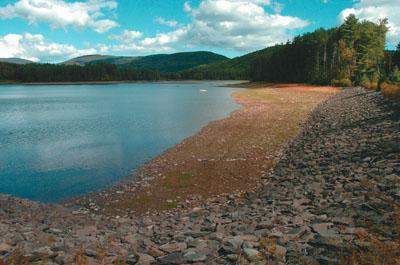 This is one of many steps that need to be taken in order to help protect Cooper Lake and our watershed as a whole. But by assuring that the sale of water outside of our small, local municipality includes our Common Council – it is a significant one. 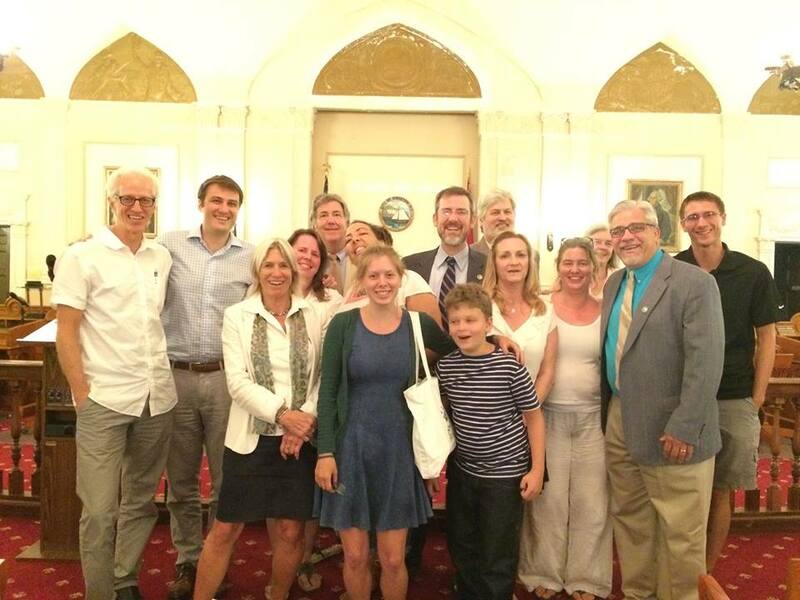 Caucus (Monday, 6/1), which is a public meeting of supporters and members of a specific political party (in Kingston, our nine alderpersons are made up of eight democrats and one republican), occurs each month the evening before the full Common Council meetings. Much discussion is generally had on all agenda items, as well as often, conclusions as to which way council members will cast their vote the following evening. There isn’t a sign-up for public comment during Caucus, however you may contact Matt Dunn, the Council Majority Leader (see email address below), if you wish to be added to the agenda. For those who can attend caucus, it is always enlightening and in this case, and if added to the agenda, will help you to better understand the dynamics that surround this issue. It is very important that the public plan to attend the Kingston Common Council meeting on Tuesday, June 2nd to speak in support of the public referendum as described above if you are in favor of it. Please consider to thank the Public Safety/General Government Committee for their leadership role here and on passing the resolution for referendum through to Council. 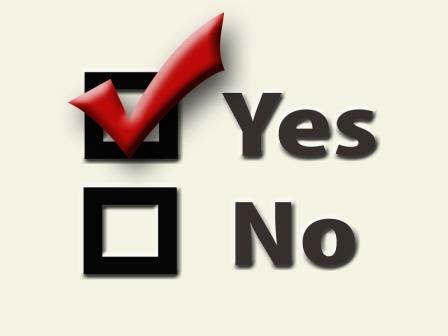 Request that the City take any necessary steps to make a referendum possible for the November, 2015 ballot. A public comment period begins shortly after 7:30pm. Please arrive 10 minutes early to sign-up to speak. Keep your comments succinct, respectful and no longer than 3 minutes in length. If you cannot be in attendance next week but wish to share your thoughts with city officials regarding this matter, with “REFERENDUM: Water Supply Powers” in the subject. Powers for Sale of Water Outside of Kingston Put to Referendum? We Say Yes! Checks and Balances. Amend Charter to Include Kingston Common Council in Certain Water Sales. Last evening, KingstonCitizens.org hosted a “Water & Waste Water Infrastructure 101” educational panel with guests Water Resource Specialist Candace Balmer of RCAP Solutions and Environmental Project Manager Fred Testa from NYS Environmental Facilities Corporation. Close to 50 people were in attendance that included elected and appointed officials, representatives from many of our environmental organizations and citizens alike. Thanks to our sponsors for this event that include the Woodstock Land Conservancy, Riverkeeper and Catskill Mountainkeeper and to Kingston News for providing a live stream of the event and the following video. oo:oo – 2:42: KingstonCitizens.org Welcomes the Audience and Guests. 27:50 – 59:30: PRESENTATION: Fred Testa, NYS Environmental Facilities Corporation FOLLOW ALONG with PowerPoint. MHI (Median Household Income) is $44,000 in Kingston, making us likely to be eligible for funding. “H0w is the role of the government changed to met that gap? Is it doing so? “The EFC brought a list of what Kingston has borrowed from the revolving funds since 1994/1998. How does EFC Work with a city like Kingston on Asset Management? We are looking at a project with new infrastructure or expand new service area. Has the municipality planned for growth in that area? Does it add properties that local growth hasn’t thought about. We are looking to see if the local gov have considered impacts on the communities. Was it planned for? Is a comp plan available to avoid uncontrolled sprawl that have adverse effects. “I think this should be mandatory attendance for all muniapl leaders. Looking at the revolving fund loans for Kingston and noticing out of 14 there are 3 that originated from the Kingston water dept, all happening in 2012 under 1/2 million – 6.2 million. In the dealings with the KWD are you in close contact or are there ongoing communications with KWD since 2012? Become a Water Board Commissioner for Kingston’s Water Department. Please submit your resume/CV (Curriculum Vitae) to Carly Williams, City of Kingston Clerk: cwilliams@kingston-ny.gov by April 30th, 2015 (because we were not given a date by the Mayor’s office, this date is arbitrary. However, we presume that it gives the city time to collect interest and make a decision). The term is five years. You must be a city resident or business person. On May 31st 2015, Water Board Commissioner Al Radel’s term will expire. Radel has served as a Commissioner on the Water Board now for 15 years, which is three terms. We appreciate his service. That means, that a spot is opening up – and we are hoping that citizens who are interested in serving will step up. The Mayor of Kingston appoints citizens (and business persons) to most Commissions/Boards/Councils in Kingston. Recently, we reached out to the Mayor’s office to find out what the process was. You know how fast we move around here, and after the second request without getting information, we decided to lay out our questions in a PETITION to give the public a chance to weigh in. That petition is live now, so have a look, consider signing it and leave a comment. Make both the description of the Board of Water Commissioner’s role and length of term visible and public on the City of Kingston’s Water Department web page. Make all of the current members of the Board of Water Commissioners biographies and length of service to date visible and public on the City of Kingston’s Water Department web page. The City of Kingston’s Mayor, who appoints Board of Water Commissioners, publish a public notice in a timely fashion announcing its search for new candidates for the upcoming term. This announcement should include a description of the Board of Water Commissioner’s expected role; preferred experience / qualifications for candidates; contact info and deadline for submissions; and the term length. The points unanswered at least expose something critical. We have some information on the process, but nothing that we didn’t already know. So why can’t the City of Kingston provide a description of a Water Board Commissioner? Or nail down their term? Or share their biographies and experience so that we know who is at the helm of our water supply? Or put out a notice in the papers to residents with a deadline for their response? As we are entering into an election cycle, we will take these things up again at an appropriate time. We intend to advocate for Kingston to overhaul it’s city charter at a future date. Please submit your resume/CV (Curriculum Vitae) to Carly Williams, City of Kingston Clerk: cwilliams@kingston-ny.gov by April 3oth, 2015 (because we were not given a date by the Mayor’s office, this date is arbitrary. However, we presume that it gives the city time to collect interest and make a decision). 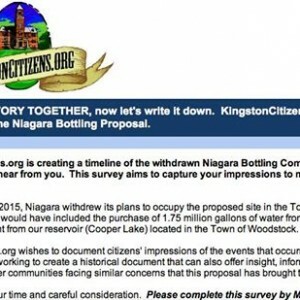 On December 29th, 2014 SUNY Ulster President Donald Katt RESPONDED to the hundreds of letters generated by KingstonCitizens.org from concerned citizens regarding the possible acceptance of the Niagara Bottling Company into the Start-Up NY program. The long awaited ANNOUNCEMENT from Governor Cuomo was issued on that same day with two of the five proposals submitted to Start-Up NY by SUNY Ulster selected. Neither of them were Niagara Bottling Company. Good work everyone! However, Start-Up NY is a new program, and we’ve seen multiple announcements made over the last 6 months at participating campuses. Until we hear otherwise, SUNY Ulster’s three other proposed businesses at Ulster (that includes Niagara) could be ON THE TABLE AT A LATER DATE. We are committed to seeing this through to the very end with you. Please READ KingstonCitizens.org’s Policy and Planning Advisor Jennifer Schwartz Berky’s response to President Donald Katt below. Thank you for your LETTER dated December 29, 2014 in response to Kingston Citizens regarding Start-Up New York. We are dedicated to promoting transparency in government through civic engagement and public education. While we are interested in understanding the decisions that led to your support of the Niagara Bottling Company for Start-Up New York at SUNY Ulster, our focus is broader. For the past decade, we have engaged the community and our leaders in meaningful dialogue about governance and community development. We believe that the public has the right and the obligation to understand how decisions are made in the public interest. In your letter, you suggest that Ulster County citizens and groups are engaged in a ‘robust debate’ regarding the Niagara Bottling Company proposal. However, so much of the information about the proposal has not been made available to the public. While we recognize the importance of confidentiality in certain aspects of business, the basis for decisions in the public interest must be clear. The public cannot engage in an open, fact-based debate where the decision-making criteria and process are not transparent. Thank you for copying me on the email you sent to the Commissioner of Economic Development and the Chancellor of the State University of New York. New York has a history of robust debate when it comes to environmental and economic development issues and input from concerned citizens and groups is an important and welcome part of that discussion. […] Reviewing the process and the credentials that were considered in the case of Niagara Bottling, I cannot imagine an outcome other than that which we reached given the defined role that the College performs.  opportunities as a magnet for economic and social growth. These required criteria are not discussed in the proposal. We are concerned about how or whether the Niagara Bottling plant can meet these and the other criteria of the Start Up New York program. I want to clarify the role of SUNY Ulster within the context of the Start-Up NY program with which we, along with many other components of SUNY have chosen to become actively engaged. The steps defined by the SUNY Chancellor’s office are clear and concise and include filing a plan for participation, which we did, being one of the first few in the state to receive approval. As a part of that defined process, we named a committee to meet with and review proposed projects to determine if the prospective company was eligible to complete a proposal to be forwarded to New York’s Empire State Development Corporation (ESD) for consideration. At that point, if recommended, the campus president forwards the project to ESD.  What was the analysis that led to your decision to support the Niagara Bottling plant project?  Was there a cost/benefit analysis as part of your evaluation? What were the results?  What were the environmental considerations reviewed by the committee?  As for the jobs and links to the educational mission of SUNY Ulster, what were the criteria used to determine whether these would provide meaningful educational opportunities for the students and link to SUNY Ulster’s mission?  In addition, did the committee evaluate the proposed wages in connection with the living wage standards in Ulster County?  What other proposals received by SUNY Ulster (you mention that about 20 businesses applied) and how were they evaluated? Is this evaluation ongoing? 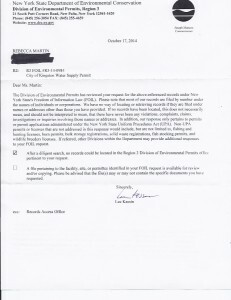 We understand that the Start-Up New York application review process requires the college to provide certification of its notification of and any written responses to the proposal by the municipality or municipalities surrounding the proposed off-campus site, as well as responses by the college faculty senate, union representatives and the campus student government. We appreciate the college’s esteemed tradition in the environmental management field and your awareness of this issue. Therefore, since the source of water from Kingston’s reservoir is in Woodstock, we question why these two municipalities were not participants in the notification process and why this documentation was omitted from the 39 PAGE AMENDED PLAN DATED AUGUST 29th, 2014 FROM SUNY ULSTER. It is now up to other agencies with different clearly defined processes to analyze and make determinations about the viability and value of the project. Being an educator and one with a strong belief in informed decision-making based upon factual information, I look forward to the process unfolding. However, I am not a party to, nor a decision maker within those systems. As the leader of SUNY Ulster, you are the key participant in this process. Although the final decisions are made in Albany, the Start-Up New York Regulations make you “a party to,” and “a decision maker” for our community. In addition, the PROGRAM REGULATIONS and STATUTE do not exclude SUNY Ulster Board of Trustees from the process. Given the size, complexity, and potentially regional impacts of the Niagara Bottling plant proposal, the planning process that you oversaw is nothing less than a critical step in the decision making process. If the SUNY Ulster President’s Office has been entrusted with the responsibility of recommending a project with so many implications for our community, we believe that you have an equal responsibility to help the public understand how and why you assessed the whole of this Niagara project as worthy of funding. Furthermore, as the SUNY Ulster Trustees have a fiduciary responsibility to the college, we believe that their role, even if voluntary according to Start-Up New York’s guidelines, is crucial in the decision making process. They are important leaders in Ulster County with deep ties in our community. We have had about 20 inquiries, from a variety of companies. Companies seek us out, we do not recruit companies. To this date we have submitted three applications to ESD for final approval into StartUp. All three are manufacturing-related. I support Start-Up NY, because it is a new program that looks to address the need for jobs in upstate NY. I also support it, because it allows unique learning experiences for students with participating partners. It is my hope that residents of Ulster County understand that I pursued the Niagara/StartUp only for the benefit of our students and the improvement of our local economy. We do not see economic development and environmental protection as an “either/or” scenario. We believe that there are better alternatives to the Niagara Bottling plant proposal. In our presentation to the SUNY Trustees, we outlined reasons for concern on both fronts. In 2007, Ulster County adopted a sustainable economic development plan, “Ulster Tomorrow,” that identified core competencies that would generate innovative clusters to build our economy. The plan was completed and approved with the help of a renowned economic consultant and input from scores of leaders in every sector in our county, including Trustees and members of the SUNY Ulster community. Although we do not have the details of the two companies that have been approved for Start-Up New York at SUNY Ulster, their business models appear to be more in keeping with the concepts of sustainable development. As you noted, there were about 20 inquiries for the program. We are interested in their proposals and the potential they offer for innovation and clusters that may truly lead to job growth in our area. A water bottling plant is not a sustainable business. So far, 90 colleges in the United States have officially banned bottled water and your students are now proposing that you make a similar commitment to sustainability in college management and curriculum. Also, as we noted in our presentation, this particular industry does not align with the well-accepted principles of clustering and sustainable development adopted in the County and the Mid-Hudson Regional Economic Development Council’s (MHREDC) plans. It is an economically isolated activity that will rely on plastics manufacturing, an industry widely acknowledged to generate major pollutants in its extraction, production, and disposal processes. The use of a publically-financed infrastructure and our municipal water supply, a natural resource with finite possibilities, to support further economic development and growth in our area is inconsistent with the goals set forth in “Ulster Tomorrow,” the MHREDC plans, and the Regional “Cleaner, Greener” Sustainability Plan supported by Governor Cuomo. Finally, this proposal is inconsistent with the “Public Trust Doctrine,” which maintains that water and other natural resources belong to the public and it is the government’s obligation to preserve them for public use. As participants in Ulster County’s diverse, educated workforce, the constituents of Kingston Citizens support SUNY Ulster and its mission: “SUNY Ulster is a vibrant community of learners distinguished by academic excellence, collaboration, innovation, service, and responsible use of resources.” We respect SUNY Ulster’s tradition of excellence in environmental and economic fields of endeavor. Your mission, including “responsible use of resources,” must be aligned with regional goals that have been defined, collaboratively, with other thought leaders who are likewise committed to define, preserve and develop our assets. Our regional assets are intertwined: our valuable natural resources have a shared and equal impact upon our quality of life as humans and on our potential for future economic development. The goals of benefitting SUNY Ulster students and improving our local economy must live in harmony with our region, its valuable natural and human resources, and its economic future. We therefore ask you to have an open and productive dialogue with us, the college community, and our leaders in economic development and environmental resource management. Given the potentially imminent decisions regarding Start Up New York, we request you meet with us as soon as possible. The attached letter was written by Town of Woodstock Supervisor Jeremy Wilber who shares solid arguments as to why the DEC should be Lead Agency in SEQR for the proposed Niagara Water Bottling project. 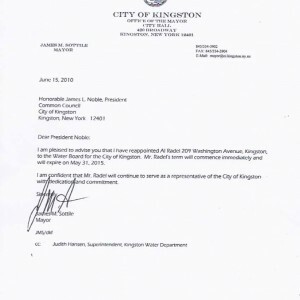 In contrast for me, it raises more concerns as to Kingston Corporation Council Andy Zweben’s recent letter also to the DEC. Where are his loyalties placed? Luckily, Kingston’s Common Council are asking the same questions and will vote on a Memoralizing resolution in support of the COK being an ‘Involved Agency’ in SEQR on Tuesday, November 4th. City of Kingston: Water Supply Permit and Water Supply Applications of 1954 & 1929. Recently, we reached out to the DEC (Department of Environmental Conservation) to see if we could receive a copy of the most recent Water Supply Permit by the City of Kingston. 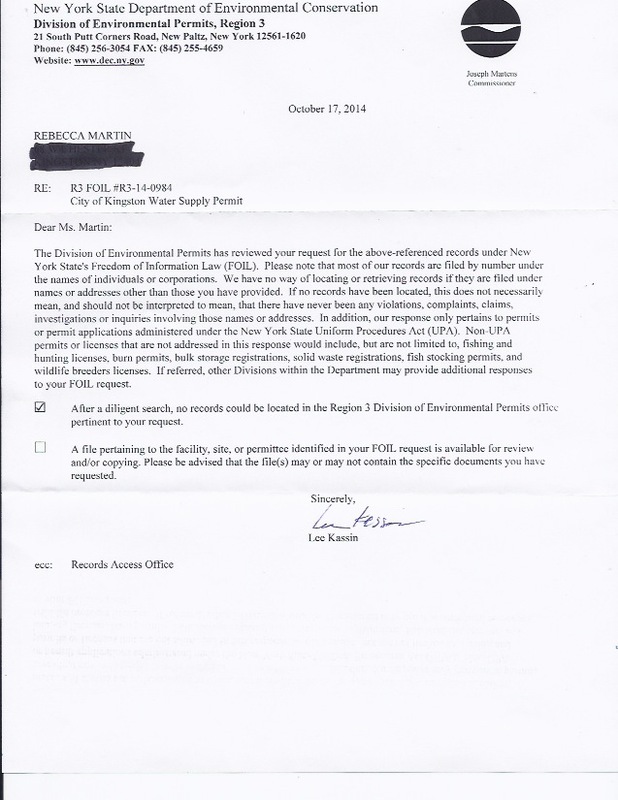 They asked that we FOIL (NYS’s Freedom of Information Law) for their records, which we did. It’s great to see so many residents and neighbors planning to attend the Common Council meeting on Tuesday, October 7th to speak or to simply be present on the proposed Niagara Bottling Co. project. As you know, the Niagara Bottling Co. project came out of the blue for most everyone with an early article in the Times Herald Record (September 10th) and shortly after, making front page news in both the Daily Freeman and Kingston Times. From the proposal presented by Peter Romano of the Chazen Company to the Town of Ulster Planning Board on September 16th, Niagara Bottling Co. expressed their desire to begin their build in 2015. In doing so, they would be using the City of Kingston’s Cooper Lake to bottle and to sell as well as scouting out other ‘spring’ sources in Ulster County and beyond. The project was approved to be sent for a SEQRA review with the Town of Ulster Town Board taking the lead. A resolution was granted on 9/18/14 – just about the time the public became aware by the media. Romano’s presentations were not on either agendas posted by the Town of Ulster. Because of the swiftness of it all, KingstonCitizens.org prepared a Facebook event so that the public could go in front of the Common Council as soon as possible. Although our passion for the subject is a no-brainer, this effort also illustrates how important it is to the people for transparent processes to be a priority for all local municipalities. Local officials, take note. (It may be necessary to do the very same thing at the next Town of Ulster Town Board meeting, too. Their next Town Board meeting is on Thursday, October 16th at 7:00pm. Public comment appears to occur later in the meeting. Stay tuned). 1. ARRIVAL: We expect a very large turnout. The meeting begins at 7:30pm, so please plan to arrive early (7:00pm) so to find parking, to sign-up to speak when the list becomes available and to get a seat. It’ll be standing room only. 2. KINGSTON COMMON COUNCIL: It appears that the Common Council were caught off guard as much as we were. Many, if not most, are as concerned too. As a first step, lets work with the council in finding a solution by including an action that you wish the Council to take that is well within their jurisdiction and abilities. We want them to come back to the table with an action in response to the public’s requests. In Kingston, those that issued the ‘will share’ was City of Kingston Superintendent Judy Hansen of the Kingston Water Department. As an independent board, The Mayor of Kingston is the only public official who is a member. Ward 2 Alderman Brian Seche was given the role as council liaison, though it is unclear if he ever attended a meeting. The council, unfortunately, was never alerted. – For the Common Council to organize a public hearing/debate with city officials and guest speakers (such as Food & Water Watch). – That a resolution be drafted to protect groundwater and Kingston’s surface water (Cooper Lake) from being being sold to private companies to bottle and to sell. 3. PUBLIC COMMENT: The public is taking advantage of the council meeting “public comment” period where anyone is able to speak. On his evening, we will be discussing Niagara, the use of Cooper Lake, and other items. As per council rules, council members “are not allowed to engage in debate during this period.” If the project gets any further, there will be time for debate and more. That’s a promise. 3. COMMENT LENGTH: Because of the number of people who will want to speak on the 7th, we ask that you come prepared with a statement. What is typical is that a speaker is given 3 minutes each. Try to keep it to that length and as noted above, consider ending with an action that you wish the Kingston Common Council to make that is in their jurisdiction. 4. THOSE IN FAVOR…: Jobs will be the argument made by those who attend in favor of the Niagara Bottling Co. project. For those who wish to, please prepare facts to counter. 5. FILMING: The public comment period will be filmed. Niagara Bottling Co. wants to come to the area (tax free) to bottle and to sell 1.75 million gallons of Kingston City Water (Cooper Lake) per day. The Water may be tax free too. It is unclear whether or not that to be the case at this time. The City of Kingston’s Water Department has provided a ‘will share’ letter to the project, but has not yet negotiated a rate (probably because they can’t without the Common Council’s permission). With an estimated 260 trucks per day coming and going out of the site! That’s a lot of trucks. According to their proposal, ALL FOR 160 JOBS when the facility is working at full capacity. LOOK HERE. 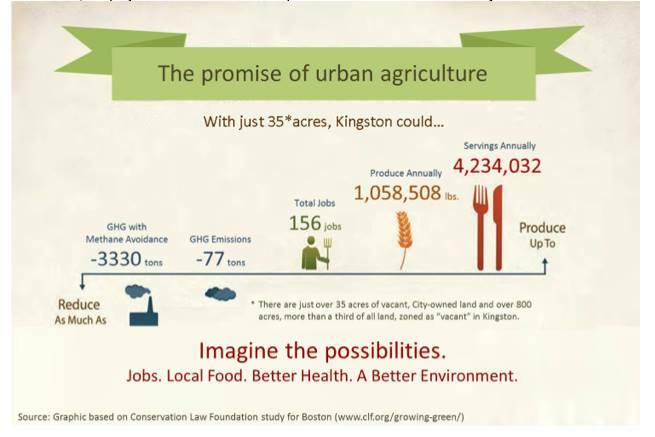 Based on an Urban Agriculture study that was created specifically for Kingston, the City of Kingston has approximately 800 acres of zoned ‘vacant’ land in Kingston. With just 35 acres working for us inside the city, we would create approximately 156 jobs. 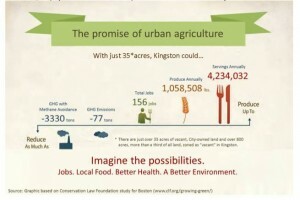 Kingston is way ahead of the curve on the Urban Ag front in the Hudson Valley, too. We can do this, Kingston.